We had the pleasure of speaking with Ithaca College journalist student Kait Clarke about sustainable fashion. She raises good questions about whether sustainability and fashion can really go hand in hand, and how to actually sustain a sustainable wardrobe. Even saying it sounds silly (too much alliteration?) but we are firm believers that if people care about their products, then they will pay for the actual costs associated with them, including the health and safety of workers. Read the article here for her take on ethical clothing in Ithaca. Well, we got robbed. We’ve run the whole gamut of emotions and are pretty much over it, especially because The Mama’s Comfort Camp came to us with a great idea to help us feel loved and supported…and make back some money! To be honest, we feel like some bad*** chicks now that we’ve made it through our first robbery somewhat unscathed. It kind of feels like initiation into being real deal business owners. Why not see the positives, right? Please read the description below of the great events the MCC is planning for us on February 8! Ithacans! Please join the Mama’s Comfort Camp (a local support network of moms) as we show our overwhelming support for Bloom after a recent robbery. Bloom, a retail store and play-space on the Ithaca Commons, is owned by two mother entrepreneurs, and its play space has become a second home to many Ithaca mothers and care givers. We want to lift our voices in an outpouring of financial and emotional support in order to demonstrate that we will not be silent after a thoughtless act of vandalism. We invite the community to join us as we take a stand to sustain a local downtown business that makes Ithaca a more family-friendly town. Co-owners Draya and McKenzie were shocked to learn that Bloom had been robbed in the middle of the night in early January. While they feel incredibly lucky that their store and merchandise were not damaged, they lost a considerable amount of cash and were responsible for fixing their shattered door, neither of which are being covered by their insurance. Although this was a devastating violation, Draya and McKenzie are amazed by and grateful for the outpouring of support they have received from the Bloom community. Please join Mama’s Comfort Camp in offering them a hand to replenish some costs and feel that their store is loved and safe! 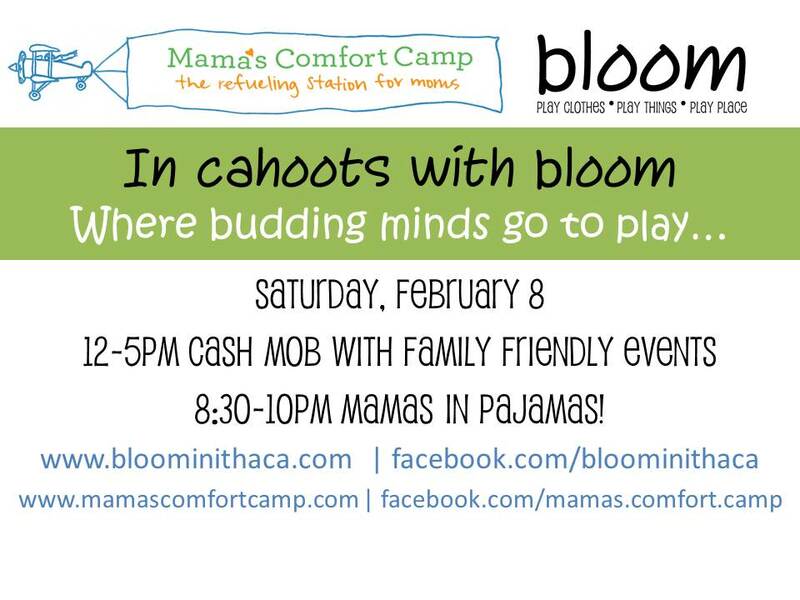 A cash mob event for Saturday February 8th encourages all those who depend on and support Bloom to come out and shop. Anyone can shop on that day whether to purchase for yourself and your family or a family you know will benefit from ethically sourced toys and clothes. They will also have gift certificates available for purchase that can be used for play or merchandise. This will run from 12pm to 5pm. We will have light refreshments laid out along with Courtney Schroeder of Little Buddhas Yoga who will offer yoga for children and families and Angie Beeler of Music&Motion who will sing family songs. -Yael Saar, Founder and Keeper of the Mama’s Comfort Camp will be guiding a Self-Kindness ritual involving gentle movement and nourishing self-talk. -Avital’s Apiaries will soothe your winter weary skin by providing scented and unscented Winter Balm for Yael Saar’s self-kindness ritual, as well as free soap samples for everyone. One lucky guest will win a goody bag fit for a queen with “Malka” Dead Sea Salt soap, “Vashti” Winter Balm, and other treats (a $30 value!). -Lital Dorchin will be teaching LILA – a ritual north african ritual of women’s healing, connecting, and dancing in the old ways. -Other wonderful presenters are in the works, so stay tuned. Clarification: Cash Mob February 8th 12-5. light refreshments and children’s yoga. Join us to shop!! February 8th 8:30pm to 10:30. Niblies, bubbly, dance, self-kindness, girlfriends, oh my… Mothers/women only (sorry dads) $25 at the door, or free for those who would spend $50 and up shopping at the store on that day. Bloom is Ithaca’s newest destination for children and families with their fun and interactive play space and ethically sourced retail store on the Commons. Since the winter of 2012-2013 caregivers have been shopping for responsible play clothes and toys and bringing their little ones to enjoy the comfort and stimulation of their art space, loft, play restaurant, and bean bags! We had a great year. 2013 bought us a successful Kickstarter campaign that helped us launch our play space and bring our dream into the real world. Thanks to all of you who have supported us by shopping in our ethical retail store and engaging with your children in our play place. We can’t do it without you and we look forward to even more good times at bloom. Happy 2014! Come see a bunch of Bloom cuties strut their ethical stuff on the Runway in Center Ithaca! 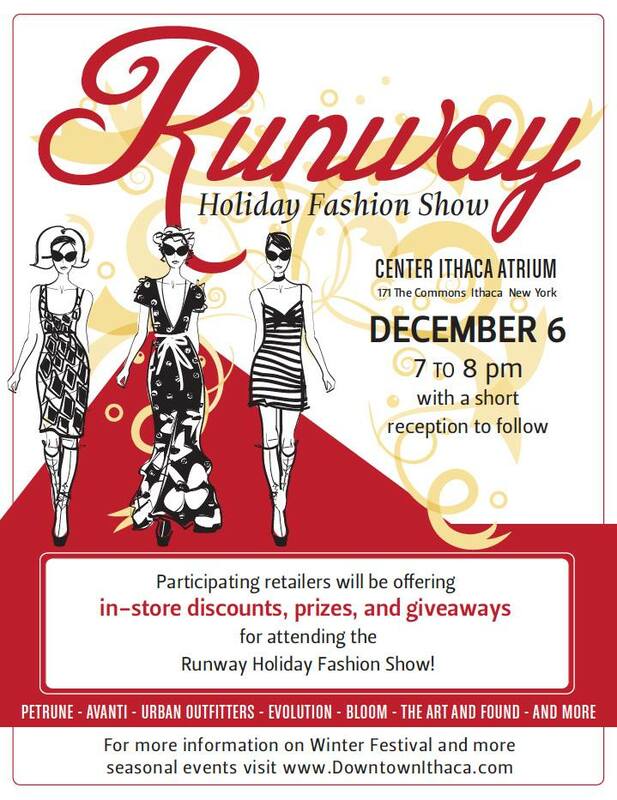 On December 6th from 7-8pm, the Downtown Ithaca Alliance is hosting the Runway Holiday Fashion Show in Center Ithaca. The show will be featuring local retailers and designers including Bloom, Petrune, Avanti, The Art and Found, Urban Outfitters, Evolution, and more. Models will be walking the cat walk in fashions for adults and children. Holiday, Outerwear, and Daytime looks will be featured in this downtown showcase as part of the Winter Festival events in 2013. Unique to this show, participating retailers will be offering in-store discounts, prizes, and giveaways for attending the Runway Holiday Fashion Show. Shop local this holiday season! By attending you can gain a glimpse of the newly stocked items available for this holiday season along with vintage accessory pairings, and introduction to sustainable clothing, seasonal trends that are just hitting the runway and the latest in winter wear for the season. The show will be held as an additional event to the special Holiday Gallery Night with over 29 participating artists. Entrance to the show is free but seating is limited. Come early to claim your seat. The show will run from 7-8pm followed by a short reception until 8:30pm. Whether you’re looking for holiday gifts or just interested in the current trends, stop by for a local fashion lesson you will never forget.